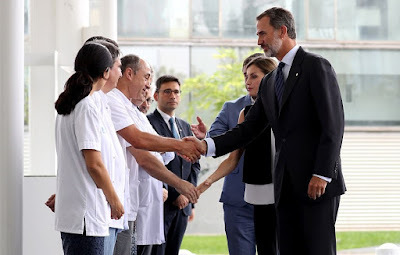 King Felipe VI and his wife Queen Letizia comforted victims of the Barcelona terror attack in hospital today, as it was revealed the death toll had risen to at least 14. 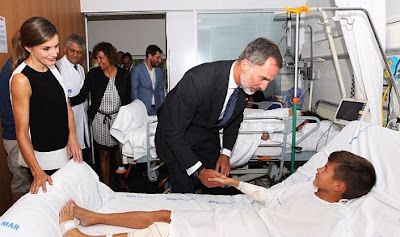 The King and Queen shook hand with doctors and nurses in the Mar de Barcelona hospital and spoke to some of the 130 people who were injured in Thursday's atrocity on the Las Ramblas boulevard. The couple have been leading the country in mourning and King Felipe led a minute’s silence in the Placa Catalunya yesterday, close to the scene of the attack. At least 14 people were killed and some 130 others injured when attackers ploughed into pedestrians on a promenade in the tourist area. The so-called 'Islamic State' (IS) has claimed responsibility for the Barcelona outrage and another attack in Cambrils.